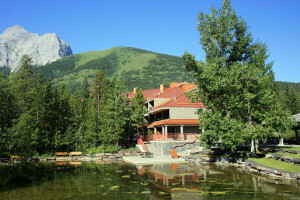 Accommodation in Kananaskis Country is extremely limited, so make reservations well in advance, especially in summer. The only hotel is within Kananaskis Village, a modern mountain resort 90 kilometers (56 miles) from Calgary that was built for the 1988 Winter Olympic Games. It was again in the world spotlight when eight of the world’s most politically powerful men met here during the G8 Summit in June 2002. In an attempt to prevent anarchy experienced at previous summits, the Canadian government decided on a wilderness destination, the first time the summit had ever taken place outside of a city. The actual summit was accompanied by Canada’s largest-ever security operation, leaving world leaders to discuss economic growth, global poverty, sustainable development, and peace and security without interruption. Sundance Lodges is a wonderful option for travelers looking to try camping or who want something a little more adventurous than a regular motel room. Campsites cost $29 per night, with rentals including tents, camp stoves, sleeping bags, and utensil kits available for minimal charge. Next up are the tepees ($57 to 83), 12 of them, each with colorfully painted canvas walls rising from wooden floors. Inside are mattresses, a heater, and a lantern. Finally, you can stay in one of 18 Trapper Tents ($85 s or d), with similar interior fittings but larger and with a canvas-covered awning over a picnic table. When you tire of hiking and biking on surrounding trails, return to the lodge for fishing in a man-made pond, horseshoes, badminton, and volleyball. Other amenities include a general store, hot showers, a laundry, and Internet access. Sundance sits beside the Kananaskis River, just off Highway 40, 22 kilometers (13.7 miles) south of the TransCanada Highway. Although a number of backcountry lodges are scattered through the Canadian Rockies, Mount Engadine Lodge is the only one accessible by public road. Technically, this means it’s not a true “backcountry” lodge, but it has the feel of one, and, besides, most people don’t even know it’s there as they speed past on unpaved Smith-Dorrien/Spray Trail. It comprises luxurious rooms in the main lodge and two cabins set on a ridge overlooking an open meadow and small creek. The main lodge has a dining room, a comfortable lounge area with two stone fireplaces, and a beautiful sundeck holding a hot tub. Breakfast is served buffet-style, lunch can be taken at the lodge or packed for a picnic, and dinner is served in multiple courses of hearty European specialties. All meals are included in the nightly rates. Mount Engadine Lodge is 40 kilometers (25 miles) southwest of Canmore, at the turnoff to the Mount Shark staging area. This modern, 412-room resort complex is part of an upscale Canadian hotel chain. It offers three distinct types of rooms in three buildings surrounding a cobbled courtyard. In the main lodge are 251 moderately large Delta rooms, many with mountain views, balconies, and fireplaces. Connected by a covered walkway are 70 Signature Club (a Delta designation) rooms, each boasting elegant Victorian-era charm, a mountain view, a luxurious bathroom complete with bathrobes, oversized beds, and many extras, such as CD players. Guests in this wing also enjoy a private lounge and continental breakfast. Rooms in Mount Kidd Manor combine natural colors with dramatic contemporary styling; some are bedroom lofts with gas fireplaces, kitchenettes, large bathrooms, and sitting rooms. Outdoor seating from various eateries spills into the courtyard, and biking and hiking trails radiate out in all directions. All in all, a good place to base yourself for an overnight hotel stay.